Researchers from the Rice University have created and isolated plasmonic magnesium nanoparticles that display all the promise of their silver, gold, and aluminum counterparts with none of the downsides. The Rice lab of materials scientist Emilie Ringe synthesized the particles to test their ability to release plasmons, the ghostly electron bands that, when activated by energy from outside, ripple across the surface of some metals. The study has been published in the American Chemical Society journal Nano Letters. Plasmonic materials are beneficial as they can concentrate light and squeeze its power in nanoscale volumes, a valuable property for biological and chemical sensors. They can additionally be used as photocatalysts and for medical applications where they can, for example, target cancer cells and be activated to release heat to destroy them. However, gold and silver are expensive. “They’re just not affordable if you’re trying to do cheap things on a very large scale, like industrial catalysis,” said Ringe, an assistant professor of materials science and nanoengineering and of chemistry at Rice. 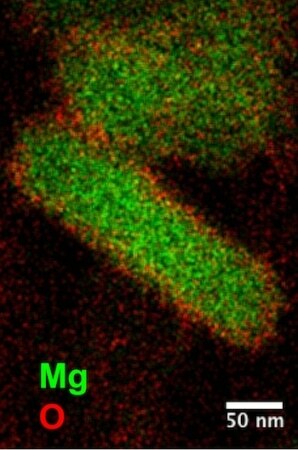 Efforts by other labs to fabricate magnesium structures turned out to be hard and created nanoparticles with weak crystallinity, so Ringe and co-authors John Biggins of the University of Cambridge, England, and Rice postdoctoral fellow Sadegh Yazdi put together their talents in spectroscopy, chemistry, and theory to produce nanocrystals in liquid and examine them with Rice’s robust electron microscope. What they created were nanoscale crystals that seamlessly reflected the hexagonal nature of their underlying lattice. “This gives us an opportunity,” she said. “Silver, gold, and aluminum, all the metals we’re used to working with at the nanoscale, are face-centered cubic materials. You can make cubes and rods and things that have the symmetry of the underlying structure. The particles proved to be surprisingly strong, she said. The lab started by mixing a magnesium precursor with naphthalene and lithium, forming a strong free radical capable of reducing an organometallic magnesium precursor to magnesium metal. The ensuing particles were hexagonal plates that extended in size from 100 to 300 nm with a thickness between 30 and 60 nm. Similar to bulk magnesium, they discovered that a self-limiting oxide layer formed around the magnesium that secured it from further oxidation without altering the material’s plasmonic properties. That helped keep the particles’ typical shape, which stayed stable even three months after synthesis and a number of weeks in air, Ringe said. “It’s formidably air-stable,” she said. “At the start, we took all the precautions we could, using a glove box for every transfer of sample, and at the end of the day we decided to just leave a sample out in the air, just to see. We tested it after two weeks, and it was still the same. The following step will be to improve the particles with binding molecules that will help them alter their shapes, which also tweaks their plasmonic response. She believes that will take one more year of work. Biggins is a university lecturer in Applied Mechanics at the University of Cambridge. The study was supported by a 3M Non-Tenured Faculty Award, the American Chemical Society Petroleum Research Fund, and the Binational Science Foundation.